On Monday, 9 July 2018 at the headquarters of the CEOE, the latest work of the Tax and Competitiveness Foundation published by the Foundation under the title “Environmental Taxation: reflections for a future reform” was presented. The Foundation’s latest project deals with new aspects of indirect taxation by means of this study of the field of environmental taxation, an issue that has been receiving particular attention from experts and the general public. In view of the undoubted interest that environmental protection awakens and the repeated requests from national and international authorities to increase the level of environmental taxation in Spain, and because environmental taxes have undergone considerable development in the various Autonomous Regions, the revision of the financing models of these regions and the local administrations – present in the political agenda in recent months- necessarily involves a review of environmental taxes. Following the introduction by Mr. Bernardo Soto, Secretary of the Tax Committee of the CEOE and Mr. Jesús López Tello, Chairman of the Foundation representing Uría Menéndez, speeches were given, as representatives of the Finance Ministry, by Ms. Elena de Ancos Lumbreras (Deputy Director General for Tax Relations with the Autonomous Regions, from the General Secretariat for Regional and Local Financing) and Mr. Alberto García Valera (Director General for Taxes, dependent on the Office of the Secretary of State for Finance). Mr. Bernardo Soto emphasised the interest in this matter and the deep concern in the business world about the effects of a possible reform in this area, which could affect the competitiveness of certain sectors and of our economy as a whole, since the sectors concerned affect strategic aspects of our economic activity. For this reason, studies like the one promoted by the Foundation are welcomed, which encourage a thoughtful, balanced reflection on the possible measures to be taken in the future. The Chairman of the Foundation, Mr. López Tello, placed this work within the Foundation’s wide-ranging research activity with a long list of studies and publications through which the Board of Trustees fulfils the commitment to provide reliable studies on different areas of taxation and comparative analyses of solutions under Comparative Law, which may be useful for the most suitable design of our Tax System. Ms. Elena de Ancos and Mr. Alberto Garcia Valera linked this study to the review of the regional financing model and with the activities carried out from the Ministry in recent months in this respect. They highlighted the solutions and proposals included in the study, even though they do not agree with some of them, regarding them as suitable in any event for carrying out the in-depth analysis that the potential reform of this area would require. They both highlighted, in particular, the repeated references in the publication to the need for an approximation and possible harmonisation of the regulations applied by the Autonomous Regions to taxes regarded as “environmental”, and the proposals made in this respect. They believe that the consideration of the Regions’ demands for financial autonomy further supports the proposals for a solution through cooperation and consensus among the various regional institutions, and regard as less feasible a solution involving framework national laws or the approval of national environmental taxes and compensation, in terms of tax revenues, in favour of those Autonomous Regions that might be obliged to eliminate their own taxes due to the requirements of the Law on the Funding of the Autonomous Regions (LOFCA). The senior ministry officials also mentioned other aspects of the study, relating to changes in the existing taxes or proposals to suppress certain taxes. In particular, they rejected the elimination of the tax on electrical energy output which is backed by the project. 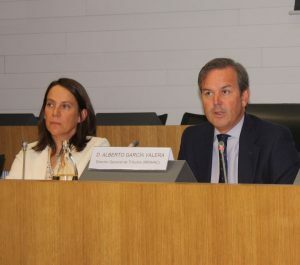 Following the talks by the above persons, presentations were given by three of the publication’s authors, Mr. Pedro Herrera Molina (Professor of Financial and Tax Law at the UNED) and the coordinators of the project representing Deloitte and EY, respectively, Mr. Pablo Renieblas Dorado and Mr. Pedro González-Gaggero Prieto-Carreño. Their talks referred to the various proposals by international bodies and the committees created in Spain to study the tax reform of 2014 and to review regional and local financing and, most recently, in relation to energy transition (in the case of professor Herrera). Mr. Renieblas and Mr. González Gaggero sought to summarise the legislative policy recommendations included in the study, in relation to a possible reform of environmental taxation. Both authors reiterated the difficulty of combining environmental protection and taxation, due to the conceptual disparity and differing objectives of actions in those areas, implying that the creation of a true environmental taxation system involves a considerable effort, in which it is necessary to include the potentially affected sectors so that from the very beginning of the process of analysing the reform they can explain their positions and criteria, thus promoting viable and stable legislative solutions that coordinate environmental protection objectives and increased tax receipts with an adequate protection of the competitiveness of Spanish companies and potentially affected economic sectors. They logically emphasised the need for an adequate design, determination of the taxable object and technical regulation of the new environmental taxes, avoiding the easy recourse to a supposed environmental conceptualisation without consistent tax regulation, this being a common deviation in the actions taken in recent years, by both the regional and central-government legislators. As a basis for their talks, the three authors used presentations that are attached as a supplement to this summary of the event. The event was brought to a close by Mr. Bernardo Soto, who thanked the Fundación Impuestos y Competitividad for carrying out the study and for their presentation at the headquarters of the CEOE, which will always be open to new initiatives of this kind.